Recently, I had another thread on my belt for my Woods mower on Betsy. That all worked out real well but another problem seems to have popped up. While mowing, the PTO starts grinding like it's partly out of gear. I recently put a new, bigger pulley for the Woods and may have self-inflicted a wound. Pulley and adapter were real hard to get on and I "tapped" it. It would work a little and then start acting up. Pulled the shaft and the only thing that looked wrong was the grease shield and snap ring had come apart. Replaced the grease shield and thought I had it. What seems to be happening is the shaft is kicking back and freezing stuck. One of the things that was indicated was the shifter lever and rod could cause this problem. My shifter rod is a little bent and there could be some slop in the hole. Sometimes, the lever doesn't come back up on it's own. I have not, yet, pulled the shifter lever. Anyy thoughts or insights would be greatly appreciated. You will most likely need: PT 317 PTO lever and shaft. PT449 PTO shifter clutch. Both are normally worn to the point that they need replacing. Take apart first for a parts inspection. Try oiling the plunger in the shift lever. I put the Blaster to it yesterday and it cleaned up. The local parts dealer also suggested checking the bushing out. Since I have to take it apart, anyhow, sounds like a good suggestion. When I had it apart before, to replace the grease shield, all the shaft and pieces looked pretty good. That snap ring being knocked out of the groove COULD allow the bearing to move forward, which, in turn, would allow the shaft to move rearward. This would cause the distance between the clutch drive shaft and PTO shaft to seperate far enough that the PTO clutch will not keep them coupled. Depending how far apart they go, you may either get NO PTO turning, or grinding. You also may have a ground down or off PTO shift lever pin ground down, which also allows the PTO shaft the move back far enough to disconnect or grind. There are several posts regarding these situations if you do a search. Good luck! I suppose there could be wear but it's not noticeable to my untrained (Bad) eyes. I've seen mention of a bushing that can get egg shaped. Not sure where this bushing is. I took a pic inside and am guessing it's that round thing the transmission shaft comes through right above the gears for the axles. Got back from the Cub parts store. Took all my parts with me. They gave me a pilot shaft bushing. Found this old thread about installing the new one. I don't see an old one. If you don't see a pilot bushing in the end of the upper transmission shaft, it is either not there, or is wornout, and mostly gone. Scrivet has said before that he has drilled out the old bushing with a long drill bit. Check the OD of the new bushing, hopefully it's the right bushing, with a dial caliper, and use a drill bit that size, if needed. It should drill rather easily into the bushing, they are not steel. Look at the front end of your PTO shaft and see if it is original size and smooth, they get worn too. Put the new bushing on it before you put the bushing in the tractor, and see if it fits good, to check it. Grease the end of the shaft, and in the bushing before putting the PTO in again, when the bushing is in place. I can't see the PTO splines at the end of the shaft in your pic. They have to be good and not worn at the end for it to work right. You can see them by removing the transmission oil filler plug, and shining a light in the hole, this gives you sort of a side view. To put the PTO together again, look in the hole and mesh the PTO shifter with the PTO clutch. It makes it much easier. 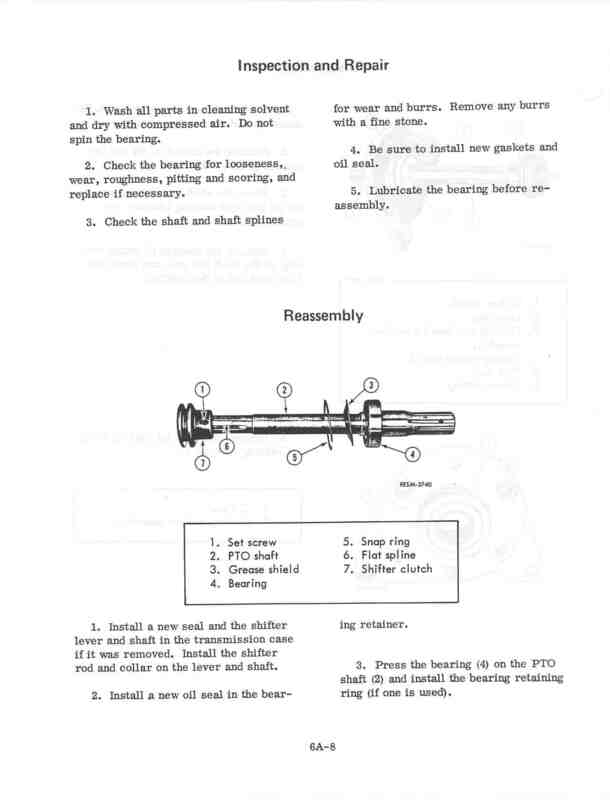 That is in the Cub service manual also. You should make sure the PTO ball bearing is all the way on the PTO shaft. Remove the snap ring holding the bearing shield and bearing in the cover, and pull the shaft and bearing out. That is a good time to clean out the old grease too. Look and see if the bearing is all the way back against the shoulder on the shaft. It is probably staked on the shaft, it might need more staking if it is not staked enough, and has moved on the shaft. It might have the newer shaft with the snap ring holding the bearing on, then there is no staking used. I don't know without a picture which style you have. Here is a pic of the shaft showing the bearing fully on the shaft. The PTO won't work right if the shaft has moved rearward, it can slip out of engaged or grind. Good luck. Thank you for all that detail, Glen. Hadn't thought about a drill bit to get the old one out. I picked up a lag bolt slightly bigger than the inside diameter of the bushing figuring I could screw that in and pull. I seem to have the newer shaft with the snap ring. I did, inadvertently, move the shaft when I encouraged the new pulley. I'm thinking my more mechanically inclined (less timid) buddy is coming tomorrow. Just to reemphasize Dale's point, the wear on the PTO shift lever pin could be on the side facing the front of tractor. While you have it all apart I would suggest you get some small hands in there to check and make sure it's round. If it's original or an OEM replacement, the tip is brass and wears pretty easy if not greased. You may miss the flattened front edge if all you do is peek in. Here is a good example of the wear. If it's original or an OEM replacement, the tip is brass. All the ones I've seen are steel. Quite a few levers have been renewed by drilling out the old pin and using a piece of 1/4" drill shank. Weld or silver solder in place. I had all those pieces out and took everything to the parts store. They gave me a pilot bushing. Just finished replacing it a couple hours ago. It needed replaced but didn't solve the problem.. The shifter lever and clutch don't look worn. Mine look in way better shape than the one in your pic. I would have bought those because I'm tired of driving an hour each way and ending up with no change. Right now my buddy and I are wondering if my shaft has the optional snap ring that fits between the bearing and grease shield. There isn't one there right now. If the shaft has no groove for a snap ring, it is the older style that the bearing had to be staked, or the shaft can slip through the bearing to the rear. It is common on the Cubs for the shaft to slip to the rear if the staking is not done. I wrote above, be sure the bearing is all the way on the shaft, against the shoulder on the shaft. Then if there is no snap ring groove in the shaft, the shaft has to be staked so it doesn't slip through the bearing when the PTO is running. Below is a pic of staking the shaft. Thank you for that great picture, Glen. Mine doesn't have those bumps or stakes on the shoulder. Mine doesn't seem to have a groove for a snap ring but there are several very small, almost dot sized, indentations around that could hold something with some nubs. Also, will that big chip hurt anything? I believe that "bump" IS one of the old stakes that is supposed to keep the bearing hard against the shoulder. ANY motion of that bearing can make the difference between engaing the shift lever or not (or grinding). You can either install the bearing and restake it (tricky but not impossible without the right tool) or TM Tractor has the newer version shaft WITH the groove for a locking ring.